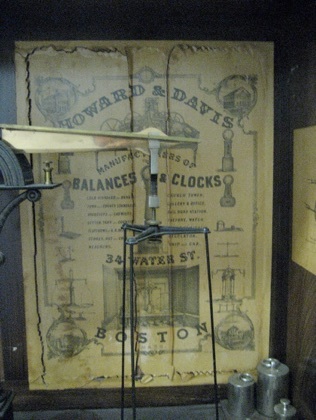 To meet the needs of the Massachusetts Weights & Measures Department, Howard & Davis designed these sets of Standards, in conformity with the Standards issued to the state by the Federal Government. Massachusetts legislature accepted their submission as the Standard for the State and ordered 330 sets - one for each town, city & county in the state. 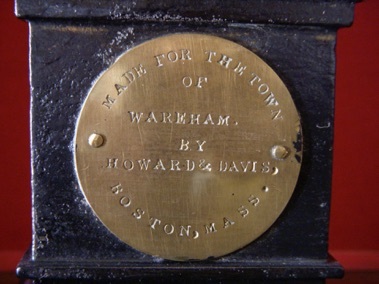 It is thought that the smaller towns may have shared sets to save costs, and it is not know how many sets were actually delivered. 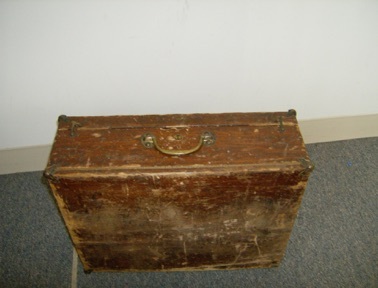 •Large wooden case, with double doors on the top and bottom. 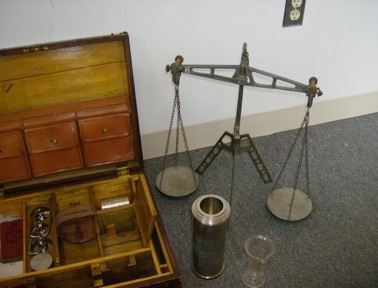 Width - 64 1/2" ; Depth - 23 1/2"; Height - 75 1/2"
•Top compartment containing an equal arm balance scale, set of weights and a brass linear measure (yardstick). 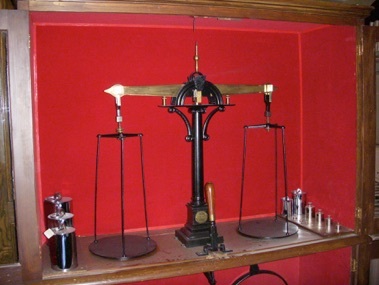 A cast iron column (round) with square stepped base and arched top mounted on shelf supports 35" long brass beam with flat circular (12 1/2" diameter) iron pans suspended from 3 rods and adjustable fork at each end of beam. 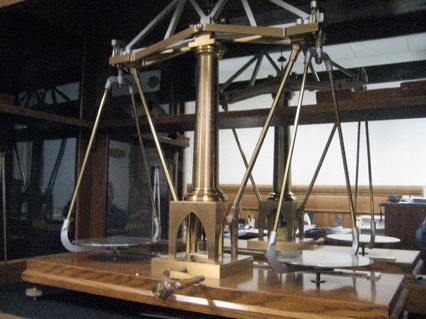 A lever in front of column activates scale and sets it at rest when released. 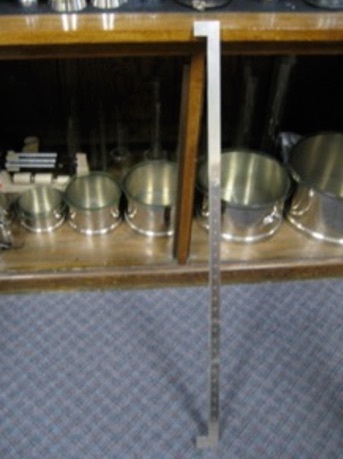 Set of 16 nickel-plated cylindrical weights including 1 and 2 dr. 1/4, 1/2 ,1 ,2 , 4 & 8 oz. ; 1, 2, 4, 5, 10, 20, 25 & 50 pounds. 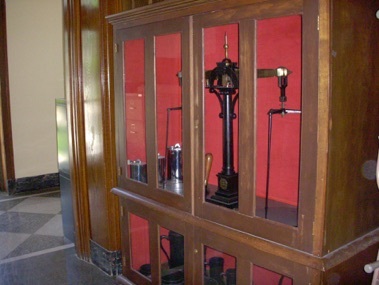 •Set of cast iron liquid and dry measures in lower compartment. 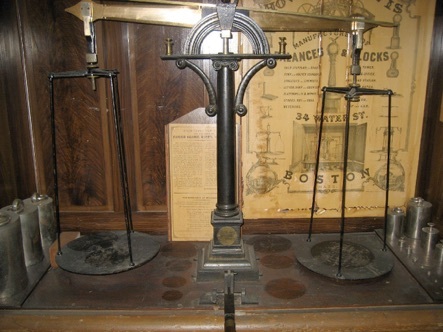 Set of 6 cast iron liquid measures with handles from 1 gill to 1 gallon; also a set of 5 cast iron dry measures with lugs, 1 quart to 1/2 bushel. 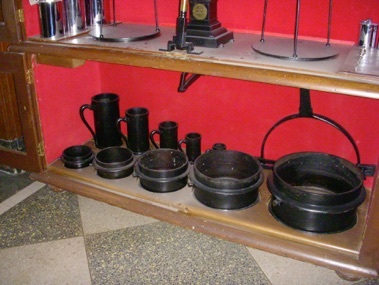 A cast iron yoke with gimbals stored in bottom cupboard can be mounted in slot in left end of cupboard and dry measures set into yoke for accurate leveling. 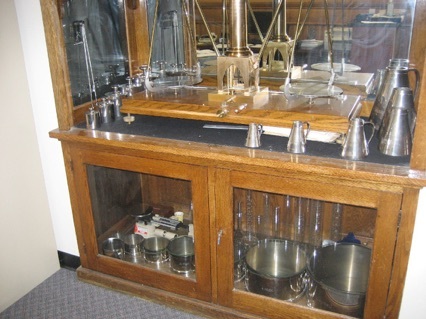 W.& L. E. Gurley designed this cabinet to hold sealer’s office equipment (standards). 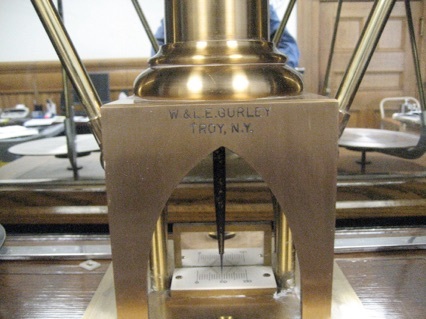 It is shown in their 1906 catalog as item #9675. 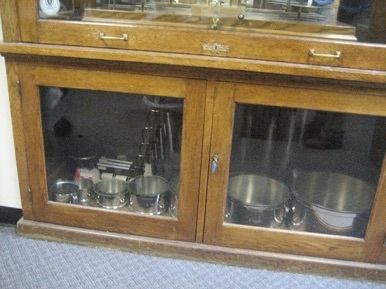 The cabinet is 6 1/2 feet high, 5 feet wide, and 2 1/4 feet deep, divided into two compartments. 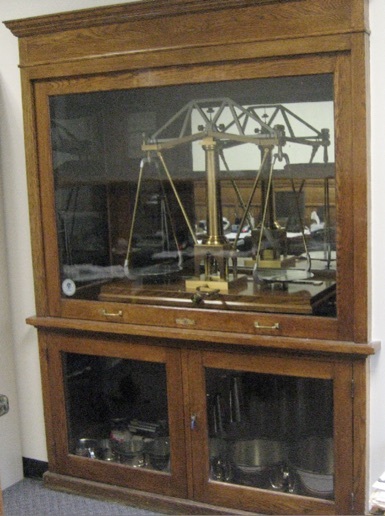 The upper compartment is designed to hold a large office balance, with shelves for the yard standard and weights. The lower compartment is to hold the liquid and dry capacity measures. 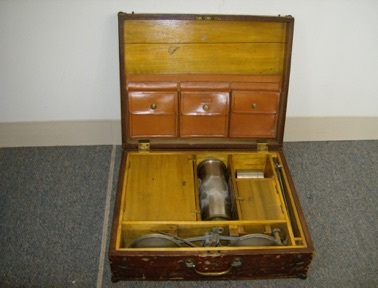 All supplied standards were manufactured in conformity with specifications established by the National Bureau of Standards, based in Washington, D.C.
Portable Inspection Outfit for Sealer use in a carrying case - designed for use by sealers traveling to verify merchants measures. Gurley Catalog No. 9550. 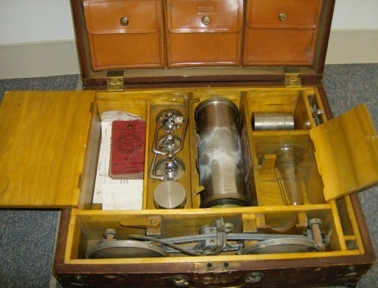 The case contains a portable balance, set of weights, nested liquid measures and supplies. 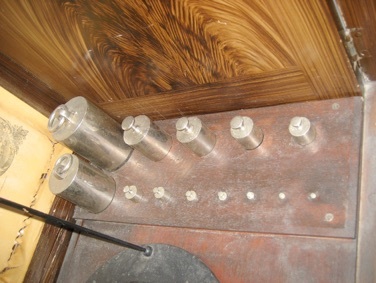 Tags in the case marked “condemned” and “not sealed” list the sealer’s name: James A. Sweeney (c1920 Sealer of Weights & Measures, Boston). 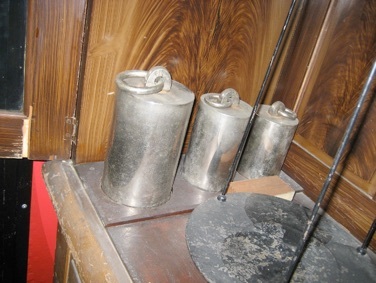 Weights are marked “B22”, “B28” and “BOS 29” for Boston 1922, 1928 and 1929.